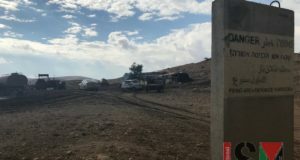 On November 11th Palestinians from the Jordan Valley villages of AelRaesAhemer, AelMaleh, and Ael Meta, were awoken by Israeli occupation forces at 6:00 AM and forced to leave their homes and villages because the military was to use the area for military training. The villages are part of Area C in the West Bank, and therefore are under full Israeli civil and security control. Palestinians in Area C, which covers over 60% of the West Bank, are practically forbidden to build on their own property; while neighboring illegal settlements continue to expand. 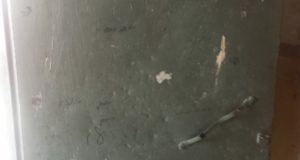 The villages undergo constant attacks and threats from either the army or settlers, including home demolitions, physical beatings, destruction of property, etc. 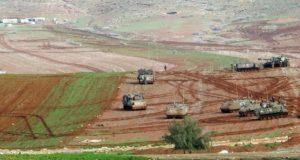 After Israeli occupation forces displaced the villagers out of their homes, they then began to practice shooting tanks, missiles, and artillery into the areas of the villages throughout the day. According to the information we received from several people, the villagers will be able to return to their homes at 6:00 PM. Some may have to go through this process every day for up to two months, until the Israeli and U.S. Forces are finished with their joint military exercise. “The Military told us that we are not allowed to return to our homes at all. We don´t know what to expect,” explained a Palestinian.